You’ll love this Slow Cooker Mediterranean Beef Stew Recipe with Rosemary and Balsamic Vinegar and your house will smell great while this is cooking! Click to see 35 Amazing Recipes for Slow Cooker Beef Stew! Click here to see 50 Amazing Instant Pot One-Pot Meals! For Friday Favorites we spotlight past recipes that you may have missed, and this Mediterranean Beef Stew with Rosemary and Balsamic Vinegar is hearty and delicious for this time of year. 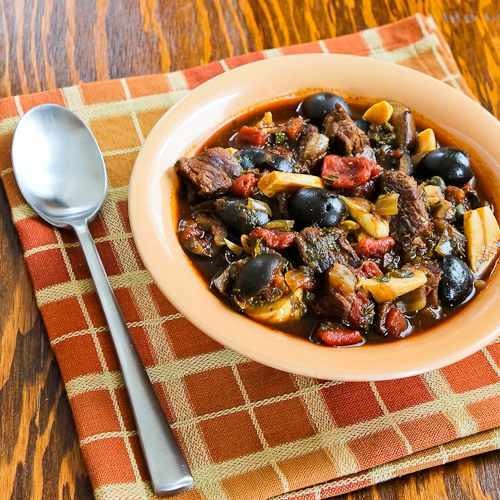 And absolutely, this Mediterranean Beef Stew is one of my favorite versions of beef stew, with so many of the Mediterranean flavors I love like olives, garlic, tomatoes, mushrooms, onions, rosemary, capers, and balsamic vinegar. For best flavor in a recipe like Slow Cooker Mediterranean Beef Stew with Rosemary and Balsamic Vinegar, brown the meat and saute the mushrooms and onions before you put them in the slow cooker. And if you do that the night before and keep the ingredients in the fridge overnight, you can cook this all day while you’re at work and come home to a great dinner. Get the complete recipe for Mediterranean Beef Stew with Rosemary and Balsamic Vinegar from Kalyn’s Kitchen. Use the Index Page for Soup or Stew to see all the slow cooker or pressure cooker stew recipes that have been featured on this site. Just when I thought that I made every version of beef stew! Love the addition of balsamic vinegar in your stew and absolutely love I can make it in a crock pot. Oh man, the combo of balsamic to tenderize and rosemary to spike the flavor! Love it. Pam, I think the variations are endless. Food Done Light, glad you like the idea of this. Thanks Heidi! I guess we were writing comments at the same time! Thanks for including one of my beef stews; I love making stew in the slow cooker.